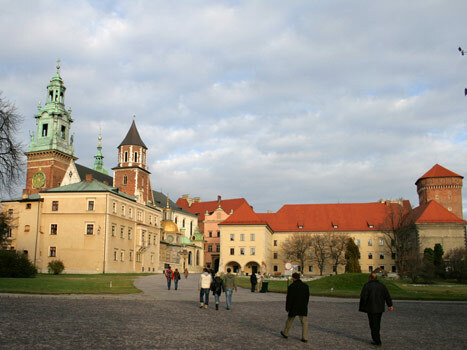 As you head south through the Old Town the streets begin to taper until you arrive at the foot of Wawel Hill, seat of the Royal Castle and Cathedral. Wawel lies on a small hill above the Vistula and it was here that the earliest settlements in the city began, some fifty thousand years ago. Wawel is less a quarter than it is a rambling complex of historic buildings. Few ordinary citizens live here, and the most distinguished residents, the Kings of Poland, passed on many centuries ago. Yet the phantoms of these monarchs are ever-present, wandering about with furrowed brows, and shaking their fists at the great what-ifs of their country's history. Architecturally, Wawel is something of a hodge-podge, with all kinds of shapes and styles jostling for attention. This might come as no surprise when you think that people have been living here since around 3000BC in the Neolithic period, and have lived and built on the hill successively ever since. However, whatever cohesion the Wawel lacks aesthetically it more than makes up for in terms of soul. For this is the spiritual home of the nation. And if one was to take England as a point of comparison, one might consider Wawel as a kind of Westminster Abbey and Camelot rolled into one. It is steeped in myth, yet with all the added poignancy of a nation that has had to endure more than its fair share of trials. And despite the apparent muddle of bits, Wawel has a charm that can exert a powerful hold. Its very lack of classical harmony becomes one of its endearing features. And besides, there are some real jewels here, among them the exquisite cathedral chapels, the renaissance courtyard and the State Rooms themselves. You can also climb up the old bell-tower or burrow down into the Dragon's Lair. All in all there is a wealth of things to do, not only for those dignified elderly folk, but for children too. i didnt think it was that spectacular. i mean the grounds were eh, nice abut castle was not that pretty. Probaly wont go there again. just came back from Poland, Krakow, the whole family had a blast especially my 7 year old daughter, everthing fascinate her about the castle. We will definitely go back there. Loved it. Me han comentado que mis antepasados son de la ciudad de Krakow. Quisiera que se conozca mas esta historia en español. Thank ! Heading to Krakow on Thursday... anyone know how to book an English Tour of the Royal Apartments at Wawel in advance please?? I've heard there's only one a day and books up in advance. Ta! Could you please work on your translation? It's horrible! Thev dragon's den is ace!!!!!!!!! Great !! I was fortunate recently to be able to visit Wawel Castle with my two daughters and two grand children. A place which I visited frequently with my grandfather during 1945 just before leaving Poland. I was able to return after 63 years to show my foreign born children and grandchildren where I came from. Your website makes it easier for us all to review our experiences. Wawel is the jewel in the crown of magnificent Krakow, can't wait for another visit there. Thank you for this page and all the others. I was first in Krakow in 1975 and haven't been there since 1977, but your reviews and descriptions make me want to return now. Thank You again. Beautiful castle, and the Cathedral is a "must". Don't excpect any good sevice or food at the restaurant, though. We waited 50 minutes for our food, and when it finally arriwed (after complaining two times) it was not what we ordered! The food was bad and expensive, not representative of Crakow at all! The souvenirs are not overpriced, and the Wawel heads are a marvel! I have been to Wawel Castle and Kracow. My wife and I consider this to be one of the most interesting, hospitable,and wonderful places we have ever been to. I would love to return to Krakow to explore and spend more time.